Sneinton Market is often a hive of activity, there are a few little cafes and a regular vegan market is a great spot for produce and food stalls. What it hasn’t had so much of are restaurant that have been successful. Pistachio is looking to change all that with a small contemporary space on Carlton Road serving authentic Persian food. A nice change from the usual dark space with thick rugs and heady incense that can often accompany Middle Eastern cuisine. The menu is pleasingly small, such that they can focus their attentions on only a few dishes…as well as making it easier for me to choose. Interestingly of a handful of starters 3 of them were listed are dips. As we were sharing a large main course we decided to give one a go, Pistachio and Feta seemed appropriate. They cost between £4-5 and are served with a basket of Iranian bread that I believe was Sangak though I could be wrong, it was quite thin and crispy. 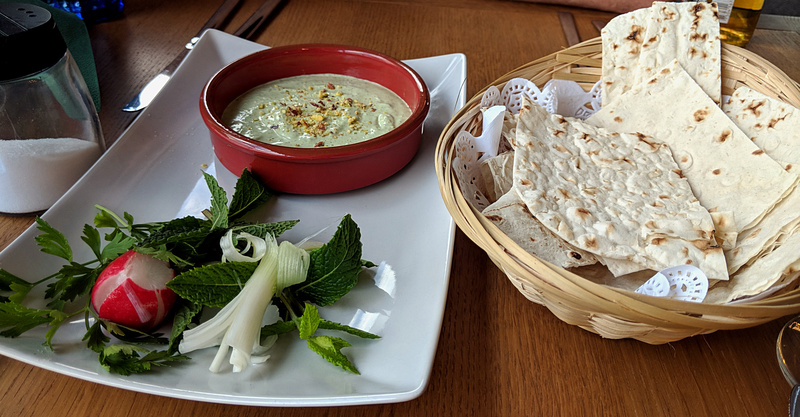 The dip itself was plentiful enough, chiefly creamy with a subtle citrus backnote which may have been from Sumac, a popular Middle Easten spice that does have a tangy lemon flavour. It was enjoyable, fresh and cooling on a warm day even if the flavours of the feta and pistachio didn’t come through as prominently as expected. Extra bread was delivered without having to request, always a nice touch. The main courses have intriguing options, a coupe of stews sounded great but on a muggy evening didn’t quite appeal. The “Mixed BBQ Grill for two” is 2 skewers of Koobideh, 1 of Jujeh and 1 of Chenjeh. 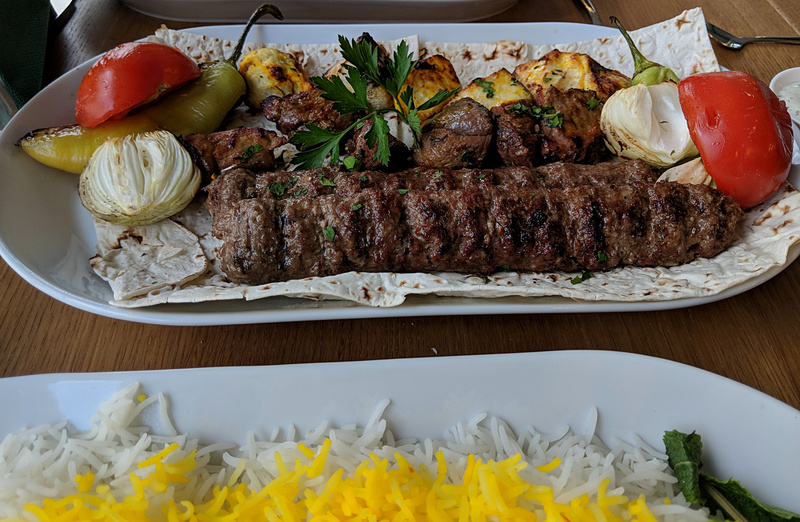 The Koobideh is a finely minced kebab of beef and lamb, it is less flavoured than the likes of a kofta as aside from the meat there are few spices added. It was to be my least favourite of the three but as it transpired when discussing later this kebab is the favourite amongst Iranians, particularly the older generation. The Jujeh (chicken) and Chenjeh (lamb) were similar in that they were chunks of the respective meats marinated in saffron before cooking. To my mind it worked best with the chicken, its less strong flavour allowing the fragrant saffron to come through more. Both were seriously moist and juicy though. More on that later. We were given a free side (just because its their first few weeks) of pickled red cabbage with some pomegranate seeds which was a welcome addition as the whilst rice was tinted with saffron it didn’t have a huge amount of flavour. 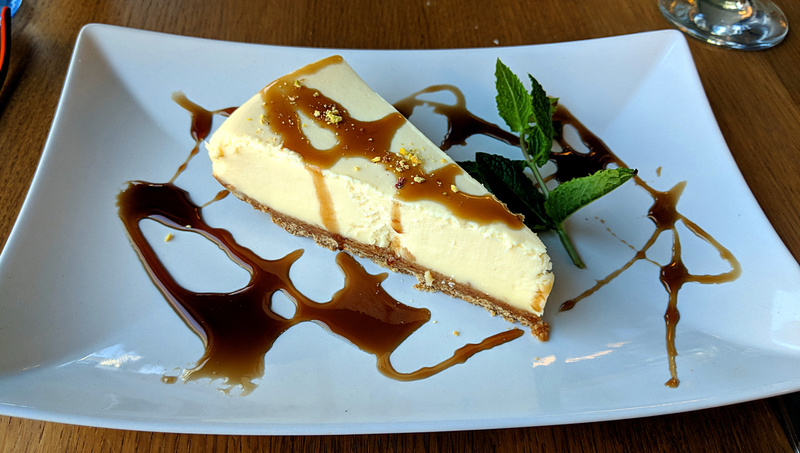 I’ve decided one of the most commonly written in restaurant reviews may well be, “after that I didn’t need a dessert… but”. As always in the name of research we solider on and after all the meat a pomegranate cheesecake sounded like it might just be fresh and fruity enough to not feel too guilty. Sadly for today they had decided to substitute real pomegranate with molasses, a common ingredient throughout Iranian cuisine. It still worked well, a sweet stickiness but having that background tang of the concentrated fruit flavour. I did ask and at this point they are buying the cheesecake in and adding the embellishments but intend to make their own as the restaurant beds in. At the end of the meal was reflecting that maybe expected more flavour, mainly that the meat didn’t have that chargrilled that I have been accustomed in a mixed grill. Which is why it was good that I had a chat with the waitress. Well, not waitress actually as front of house is managed by one half of the partnership who own the business, her husband the chef and Iranian. It turns out that when grilling the Iranian approach is to keep basting it, which is why it was really moist but didn’t have those tasty black bits. It may seem obvious but often you are faced with a meal without a fundamental knowledge of that cuisine and knowledge of what the kitchen is trying to achieve. It happens less and less as I eat and review more restaurants but here I enjoyed it but was left wondering whether I gave the credit that was deserved. I’d like to go back to try more and if I was more local to them I could see myself popping in on a regular basis. The food is good, the service providing the friendly familiarity that makes for a good neighbourhood haunt.